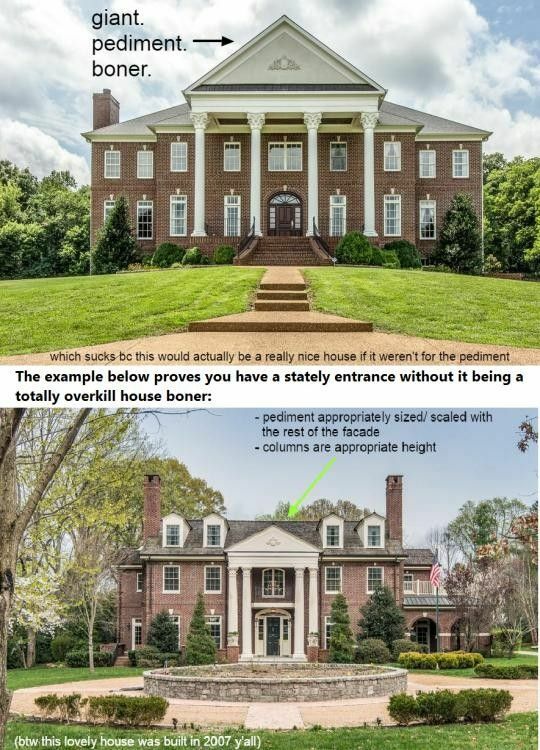 As America -- and the world -- continues to shake off the giant hangover that was the Great Recession, there remains one symbol of our excess and, some might say, poor judgment, that can elicit a particular type of groaning and remorse: the McMansion. Anyone who's watched an episode of Cribs or driven through an affluent (or affluent-ish) outer suburb or exurb can spot these eyesores: garish, hulking properties often squeezed onto lots several sizes too small, the ne plus ultra of what it means to have money and a desire for conspicuous consumption without taste. And, during a time when young people are increasingly abandoning suburban comforts for the excitements -- and challenges -- of cities and learning from Marie Kondo the joys of uncluttering, the thought of plowing your life savings into some 6,000 square foot beige-on-beige monstrosity with unnecessary home theaters and extra kitchens strikes many Millennials as anachronistic and wasteful. Now there's a delightful new Tumblr that hilariously gives voice to this collective repulsion and intelligently describes exactly why it is we feel that way. 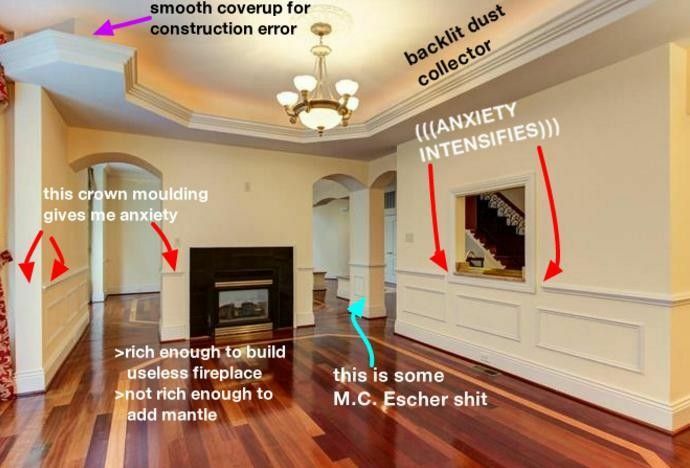 McMansion Hell launched a little over a month ago as the brainchild of Kate Wagner, a 22-year-old grad student studying acoustics at Johns Hopkins University. A longtime architecture buff who's studied the subject in school and says she owns an estimated 100 books on the topic, Wagner posts photos of McMansions around the country she encounters on real estate listings and breaks down exactly why they hurt our eyeballs. Scattered among these photos and funny descriptions are thoughtful explorations of the kind of economic and social conditions that led to the rise of the McMansion as well as the features and traits that differentiate a McMansion from a regular old mansion. Up until now Wagner was anonymous (she gave us permission to reveal her full name and some biographical details) and so after we first became obsessed with her blog, we knew we had to track down the person behind it. Can you share more about your background and why you started the Tumblr? I'm a grad student at John Hopkins where I study acoustics. As far as why I started this blog, actually it was never really meant to take off like it was. It really just started as a way for me and three friends of mine to laugh at ugly houses on real estate listings. Then I decided to explain to my 15 readers why this is bad architecture in the most basic way possible and that post went viral somehow and then all this stuff started happening. I got a call from a literary agent to write a book and now I'm going to be giving a TED talk at TEDx Mid-Atlantic. Congratulations! Why do you think it's caught on with people so much? I think it's been successful because of the combination of humor and information and I think there are two audiences -- one is young people who are angry at the decisions their parents made and the other group is older people who are nostalgic for the way things were not only before the recession but before we started seeing a house as an asset. We went from seeing a house as a place to seeing a house as a commodity to be bought and sold and traded. In the '80s it started to become common practice to think about selling your house before you even bought it. Like "Oh, you have to have this, this and this for re-sale value." The creation of HGTV in 1994 really blew that up as well. It's just a cultural shift in how we think of the home from something permanent versus something temporary. It's starting to come out now that these McMansions from the 2000s right before the recession are not selling. And people are like, "Why aren't they selling? Is it because people aren't buying big houses?" I don't think that's necessarily the reason. People who are gonna buy big houses are going to buy new, big houses. They don't want to buy the houses from before the recession because these houses are heavily influenced by trends and trendiness and now they're considered to be out of style and passé. And they weren't built to last either. You'll see really crappy craftsmanship. One of the interesting points you make about the difference between a mansion and a McMansion is that a mansion is designed by an architect but a McMansion is designed by a builder. Can you talk more about that? I really think the trend comes from what happened in the 1930s, which is when architects decided to abandon residential housing for the middle classes to go after large public works projects. And when architects abandoned the middle classes, the builders in the post-war era swooped in. People have this connotation of the builder as the small America craftsman who builds their house by hand with a hammer and nails but builders after the war became huge national corporations. But in the years after the recession from 2008-2010, we saw house size shrink for the first time in decades and people took into consideration [the idea of] making houses with a smaller footprint. Because you had to work with less, they took into consideration continuity and architectural principles rather than just blowing up a huge facade and not really caring. They had to make a tiny thing look good and it takes a lot more effort to make a tiny thing look good in the eyes of a lot of people than a big thing. When did you first become interested in McMansions and architecture? I grew up in Southern Pines, North Carolina in this really ecologically sensitive area, the sand hills of North Carolina, which features a lot of extremely rare plants and when I was growing up I was always an amateur naturalist and had a journal with all of the plant clippings and stuff like that. It was a really special place and my house was surrounded by woods. It was a low-density suburb built in the 1970s so there was tons of space in between the houses and there were acres of beautiful woods you could go and explore. But when I was 12, they cut down all the beautiful trees to build McMansions. Was that the first time you started to really be aware of McMansions and their impact on not just our eyes but also the environment? Definitely. It was a matter of taking someplace that was special and turning it into someplace that could've been anywhere. It was ignoring the landscape and ignoring the sense of place and the pursuit of the generic over something that really integrated with its environment. My parents never cut down any of the pine trees except for the ones that were threatening to fall on our house. It's an interesting characteristic of McMansions that one of their other defining qualities is that they're huge houses on small plots of land. There's a fundamental disregard for the environment. I think that that's why it's gonna be a temporary phenomenon ultimately. I got a question that said, "Do you think that someday architectural preservationists are going to try to save the McMansion?" and I said, "I don't even think it's going to last 10 more years." They weren't built to last in the first place and you can already see the roofs are starting to leak because they're so ridiculous and the stucco or the siding is starting to fall off or get water damage because people don't consider the cost of maintaining a house of that size. They think of building it and you don't have to mess with it anymore but maintenance is a huge part of home ownership and homebuilding and to ignore that is starting to cost people a lot of money. A lot of people are trying to sell their McMansions because they know it's about time to start replacing the roof and other stuff and they want to walk away from the hole in the wallet that it's starting to become. 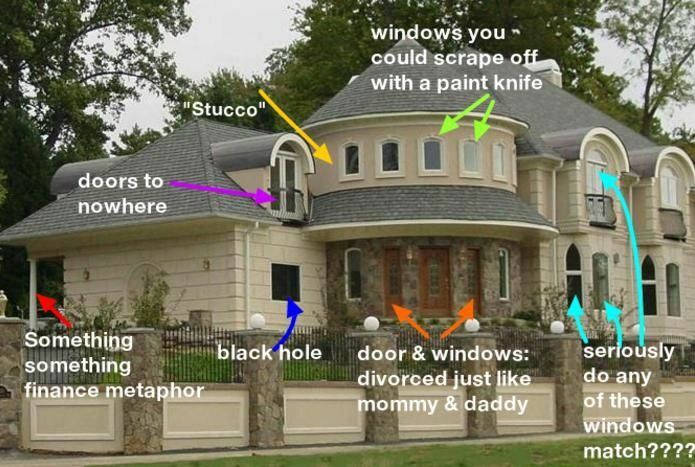 When I think of a McMansion it reminds me of almost every house you would see on MTV Cribs. You'd go inside and they'd be all beige or sparsely furnished. 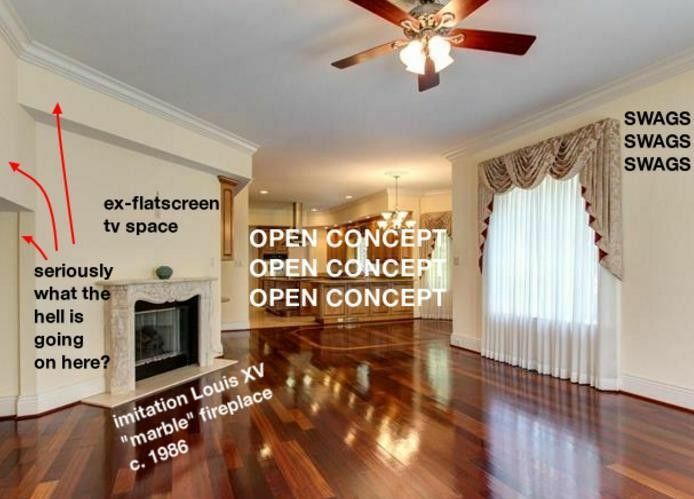 Some of the best posts on your blog involve descriptions of interior design trends in McMansions -- can you talk more about what these trends were from the '80s through the 2000s? When the [economic] markets are bad like, say, for example, in the '70s, a time we also had an energy crisis, we had smaller houses and needed to focus on coziness and eclectic things because our houses were reflections of our personalities. But when Reagan took office and oil became super cheap again, you really started to see this phenomenon of the large houses going up. And when markets are doing really well we tend to go back to the really traditional and we saw this in the '80s, too. What's interesting though is that while the modern style has stayed the same forever -- people still have Eames chairs and Bauhaus chairs or whatever -- because it's all about functionality and use and iconicism, the 'traditional' goes through huge fads almost in cycles. What were those cycles in the different decades? In the '80s there was a lot of emphasis on luxury and bringing back things from periods that are commonly associated with luxury. So we saw Louis XVI pieces become ubiquitous in the '80s, plush fabrics on walls, wallpaper...but they became Disney-fied and cartoonified and you saw Laura Ashley and lots of goofy, frilly things. The number one change in interior design in the '80s was the transition of the bathroom from being a private place and a place that was solely functional, to being this lush place of pleasure and luxury. That's when the jacuzzi tub became huge and that's when the walk-in shower became a thing. It was really in the early '80s that we started seeing huge master bathroom suites. Before that was just a private room that no one wanted to talk about but then it became something to show off. There were also huge curtains and all of the fabric matching, from the curtains to the pillows to the door -- all this coordination. This progressed until the late '80s when the market crisis happened and so we saw in the early '90s the frilliness [decline] again. That was also the rise of Ikea and the white kitchen. There were a lot of minimal things in the early '90s because the market was bad and we were returning to this sleek design trend. The decade started out with the Ikea [stuff] and white Pottery Barn couches but then we left that behind in the mid '90s as the market got better and we started to carry things over from the '80s. We had country cabinets and started putting things on top of the cabinets in the kitchen to make it look more homey [and traditional]. The '90s really focused on the farm house and the country aesthetic -- like simple living but in a ridiculous way. Instead of modeling our houses and our interiors on the palatial estate, we modeled them after the country estate, the getaway place. There were a lot of wallpaper borders and things that we consider really dated like colored carpeting. The 2000s were extremely interesting as a period of interior design because there's specifically nothing interesting about them. The reason for this is because we started designing our houses for sale. That's why you see all the walls are beige. We wanted people to walk into a house and picture their own lives in it and if everything is painted a different color they wouldn't be able to see that and that would hurt the retail value of the house. There was this show in the 2000s called Design To Sell on HGTV and that was the epitome of 2000s design, which was make everything earth tones, crown molding, it became a checklist of things that people perceived as increasing the equity of your house. We also really started to see the rise of Pottery Barn and equating Italy with luxury -- that's where you get the Tuscan idea and stencil paint on the wall starting in the late '90s that was the first-wave of 'shabby chic.' This is also the era of Extreme Home Makeovers or Trading Spaces and these ridiculous rooms or themed rooms like the media room. It was really popular, but if you had a media room no one ever used it. Same with the game room, it became a huge thing. Like if we have a room with a pool table in it, it's the "game room." What do you see as the defining architectural and interior trends of today -- the 2010s? The most interesting thing we saw in the early 2010s was the really seamless blend between modern and traditional, which was so refreshing after years of being completely bifurcated. There's also a lot of influence taken from Mad Men -- people don't realize how much of a cultural phenomenon Mad Men was. People really revived the aesthetic from the '50s and '60s. Mid-century furniture came back but we blended it with traditional interior design. Also I don't think stainless steel is ever going to go away. People are always like, "What's the next thing after stainless steel?" There is no next thing after stainless steel. There's always going to be stainless steel because it's a sleek, professional look that will always blend the modern and traditional, in the context of every kitchen. Along with those trends, we started to see the use of wallpaper again after so many years. We're also starting to see paint being explored more. We got so tired of beige it's all about expressive paint colors. This year especially is the return of dark blue -- dark cobalt blue. What are your favorite and least favorite contemporary trends? In terms of what's going to be dated, I definitely think people are already getting tired of the industrial thing. I also think that wallpaper is always going to go through huge and passionate phases of being 'in' and 'out.' We'll be super into wallpaper for a decade and then we'll be like "wallpaper is so stupid." But personally, I like the accent wall. If you have an unbalanced room you can really balance it out by having an accent wall. I also really love that mid-century furniture has come back because so much of it is fun and interesting. I also like that we moved away from carpet and back towards the area rug. As for colors, the new beige is warm gray. All the new McMansions are gray. Gray is great but when you have too much of it, it's really ugly. But I think one of my favorite things about the 2010s is how creative lighting fixtures have gotten. Back in the '80s you had brass chandeliers, then the '90s you had the brass and silver chandelier, then in the 2000s you have the bronze chandelier. Now we see an explosion of creative lighting decisions [even if that's] an interesting floor lamp. The one trend that I really can't stand though is mirrored furniture. What outdated trends do you think will make a comeback? I think it takes 60 years or so to stop thinking certain furniture isn't tacky anymore. My prediction is the big Lauren Ashley curtains are going to come back. One thing I think is really interesting on your Tumblr is the comments you've been getting and the questions from people abroad. Often we think a McMansion is a quintessentially American thing, but they exist all over the place and I'm curious to hear your thoughts on both the McMansion's relationship to America and also how the McMansion exists in other places. I know that for instance in Ireland, [the McMansion trend] started later than it did in America and it collapsed harder. It seems to mostly be an economic phenomenon rather than a cultural one. Returning back to our earlier conversation about why your Tumblr seems to especially be popular among young people, it would seem that not only are young people rejecting their parents' values but they're also coming of age during a time that has other trends affecting the decline of McMansions. For instance people are choosing to remain in cities rather than move to suburbs, they're prioritizing the quality of possessions versus the quantity, there's a focus on minimalism and everyone's obsessed with Marie Kondo and de-cluttering. What do you think about all of this? I think that what it really boils down to is the previous generation -- the McMansion buyers -- [placed an emphasis] on owning and having assets and this [younger] generation is now more interested in having experiences. Having the experience of community by living in the city, having the experience of having a house that's well-crafted. This is also the first generation that really grew up with the concept of global warming and we have more of an urgency because our lives are going to be impacted by it. For a lot of young people that grew up in the suburbs, once you reached adolescence, there was a quality of life that was really impacted by the isolation of the suburbs and I think that has played a huge role as to why the younger generation is rejecting this notion of 'the big house' and this notion of always being in the car. What part of the country do you think has the highest density of ugly McMansions? When I first started the project I googled highest income counties in America and went from there. Places like McLean, Virginia and Potomac, Maryland -- all the DC suburbs -- are just horribly gaudy. In McLean, where a bunch of lobbyists live, there's a replica of the White House. But it's the cheap Walmart version of the White House. It's ridiculous. It's all about control. People want their houses to make them feel like they're in control of their lives. But ultimately you find McMansions usually in suburbs outside of really major cities. There are a long along the Gold Coast of New York [in Long Island] and Morris County, New Jersey . You don't really see it as you get further north of New York, like in New England. There's also Florida, which is ridiculous, or Texas, which is just endless. California, too. The suburbs of Nashville also have some horrible houses and there are pockets in Colorado, too. They're just really tacky. Arizona, which was super impacted by the 2008 crash more than any other state, has some really ugly houses, too. It's funny, McMansions are exactly where you think they would be.